Ron Clarke will be forever known as the best athlete never to win an Olympic gold medal. He maintained his connection with sport all through his life: as mayor of the Australian Gold Coast, his adopted home, from 2004-2012, he played a key part in securing the 2018 Commonwealth Games for that region. A distance runner of outstanding ability and courage that Clarke,set 17 world records, is best remembered. He won 10,000 metres bronze at the 1964 Tokyo Olympics, and four years later at the Mexico Olympics ran himself to a state of agonised collapse in the rarefied atmosphere as he finished sixth in a 10,000m race won by Kenya’s Naftali Temu. To the day he died, he could never remember anything of the last lap. The pictures of the Australian team doctor sobbing over Clarke as he held an oxygen mask over his face went all around the world, and that image remains an indelible one in the history of the sport. The powerful, barrel-chested runner was reported to have been near death and suffered heart damage which would have an impact on his health in later years. Two days later he lined up for the heats of the 5,000m and qualified for the final, where he finished fifth in a race won by another African, Mohammed Gammoudi of Tunisia. It was not that the oxygen-thin air had taken Clarke by surprise – he had trained in the Alps in an effort to replicate the training conditions in which the majority of his African rivals lived. But it was not enough, even for someone who regularly took large chunks out of world records across the broad area of endurance running. 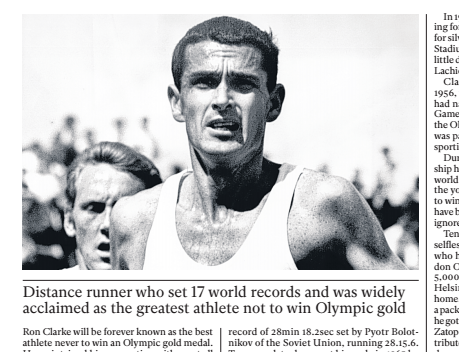 In 1963 Clarke beat the world 10,000m record of 28min 18.2sec set by Pyotr Bolotnikov of the Soviet Union, running 28.15.6. Two years later he was at his peak: in 1965 he undertook a 44-day European tour, competing 18 times and breaking 12 world records, including the 20,000m. At the White City stadium he became the first man to run three miles in under 13 minutes, lowering the world record to 12min 52.4. Four days after that, in Oslo, he took the 10,000m into a new area, becoming the first man to run it in under 28 minutes as he clocked 27:39.4, a record which stood for more than five years until Lasse Viren chipped a second off it in winning the 1972 Olympic title. It was a similar story in the 5,000m. In 1966 Clarke bettered the mark of 13min 24.2sec set by his long-time friend and rival, Kip Keino of Kenya, setting a mark of 13:16.6 which lasted more than six years until Viren, again, hunted it down in 1972 with 13:16.4. Towards the end of his career, in an effort to make himself less vulnerable to faster finishers, Clarke applied himself further down the dis-tances, lowering Michel Jazy’s world two miles record by three seconds in 1967, and taking another 0.2sec off that the following year. Given how he transformed the events in which he took part, and how painstakingly he worked on any potential weaknesses, it was a strange and at times cruel irony that he would finish without a single gold medal from any major championship. Apart from his Olym-pic bronze, he won silver in the three miles at the 1962 British Empire and Commonwealth Games, and added two more at the Commonwealths of 1966 in Kingston, Jamaica. In 1970 he went to Edinburgh aged 33, look-ing for a last go at gold. Again he had to settle for silver, in the 10,000m in the Meadowbank Stadium as he came home in the wake of a wiry little dental technician from the Vale of Leven, Lachie Stewart. Clarke’s Olympic connection began in 1956, when, as a promising 19-year-old who had narrowly missed selection for his home Games in Melbourne, he was chosen to light the Olympic cauldron. That same year Clarke was passively involved in a memorable act of sporting chivalry. During the 1956 Australian mile champion-ship he tripped and fell, and John Landy, then world record holder, doubled back and helped the young runner to his feet before going on to win the race. Many observers felt he could have bettered his world mark of 3:58.00 had he ignored his fallen companion. Ten years later, Clarke provoked yet another selfless act. In 1966, Emil Zatopek, the Czech who had won the 10,000m at the 1948 Lon-don Olympics and an extraordinary triple of 5,000m, 10,000m and marathon at the 1952 Helsinki Games, invited Clarke to visit his home. When Clarke left, Zatopek handed him a package which he asked him not to open until he got home. When Clarke did so he discovered Zatopek’s 1952 10,000m gold medal – a tangible tribute to a great runner who had not had his due reward. Mark Peters, chief executive of the Gold Coast 2018 Commonwealth Games Corporation, said Clarke “spoke the language of the athlete” and was an important member of the team which had secured the Games. MIKE ROWBOTTOM of UK The Independent.